On 18-19 October, Eastern Partnership Civil Society Forum (EaP CSF) participated in a Common Security and Defence Policy (CSDP) Communication Workshop for EaP Countries in Tbilisi, organised by the Ministry of Defence of Georgia – in cooperation with the Embassy of Lithuania and External European Action Service (EEAS). The workshop took place under Platform 1 – Strengthening Institutions and Good Governance focusing specifically on Deliverable 12 (“Stronger security cooperation”) of 2020 Deliverables and building resilience to new security challenges, such as hybrid threats and disinformation. The workshop looked closely at both traditional and non-traditional (i.e. social and online media) ways of countering hybrid warfare – providing its participants a practical, hands-on perspective from the ground. What is more, the workshop opened the floor up for discussion – giving a chance for strategic communications experts, EU officials and government representatives to weigh in and debate better ways of responding to these challenges. While there is plenty to learn from each other’s experiences, there is a need for a (better) coordinated response, learnt the workshop’s participants – not only at the international, but also interagency level. Representing EaP CSF, Mariam Grigalashvili (GIP – Georgian Institute of Politics) and Nikoloz Legashvili (“Article 42 of the Constitution”, Georgia) took part in discussions on Georgia, Moldova and Ukraine and their participation in EU-led military and civil operations, which address some of the above threats. 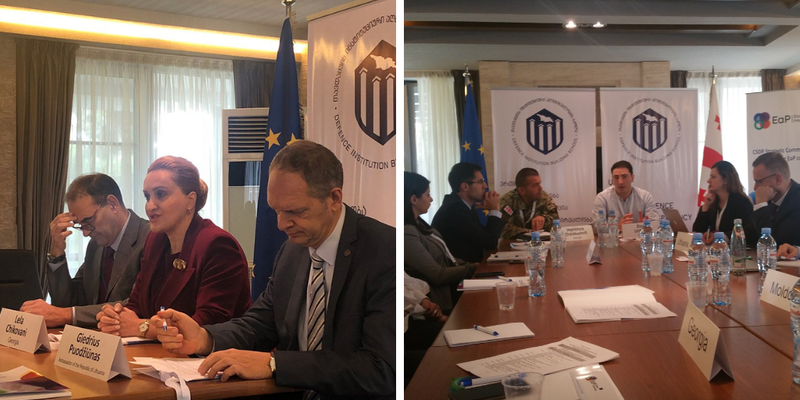 They also had a chance to listen to EU representatives, based in various missions in the region – as well as EEAS East StatCom Task Force, created in 2015 to specifically tackle disinformation.